Now the real fun begins – getting out into the countryside and collecting the seeds that will grow into the trees of our future! Please remember to obtain permission from the landowner before you begin collecting. A site with special protection, for example an Area of Special Scientific Interest (ASSI), also requires government permission. It is important to collect seeds at the right time. If collected too early, the seeds may not be fully developed and you may affect the ability of the seed to germinate. If you wait too long, the seeds might be taken by the wind or the local wildlife. Wild cherries will be quickly eaten by birds or wasps. Hazelnuts are easily discovered by mice and squirrels. Acorns might be carried away and buried by jays for eating throughout the winter. Even gorse seed can be eaten by tiny weevils if the pods are left too long on the plant! Seeds that are dispersed by wind, like birch, can be blown away in even very light winds. It is a good idea to regularly check the development of fruits that you plan to collect. This helps to determine the best time for collection. 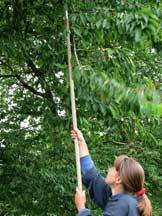 If the crop is within easy reach, some seeds can be collected by hand from the tree. With certain types of seed, a large amount of seed can be collected in a short time this way. 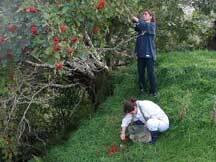 Bunches of berries can be carefully removed using secateurs. But please take care not to remove any buds. This is where next years growth will begin. A stick with a hook can be used to bend branches within reach – but not too far or the branch might break! Or let gravity do the hard work and collect from the ground! This type of collection is especially suitable for larger fruits, such as acorns, hazelnuts or crab apples. Again, timing is crucial, especially for hazelnuts. The first nuts to fall are often empty and mice will clear up any full ones very quickly! Buckets or bags should be used for seed collecting. One point to remember when collecting is the relatively high moisture content of tree fruits and seeds. If they are kept in sealed or non-breathable containers for any length of time, they will begin to heat up and deteriorate rapidly. For this reason, fruits should not be piled too deeply (i.e. don’t overfill your buckets) or stored in hessian, cotton or paper bags for the journey home. They should then be kept in a cool, dry place (a fridge is ideal) until you are ready to extract the seeds.